Yesterday marked the 100th anniversary of nearly one-and-a-half million people killed during the genocide campaign against Armenian and Christian minorities by the Turkish Islamic Ottoman empire -- I would note, this was history's last caliphate prior to ISIS. Now, the current leader of Turkey can deny that a genocide took place; and the current White House can refuse (for the seventh straight year) to use the word “genocide” when referring to this atrocity, but they can't make the truth disappear. 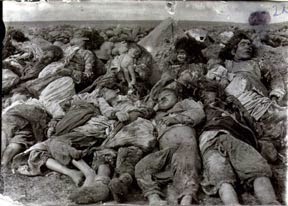 Historical scholars stand beside groups like the Armenian National Committee of America (ANCA), who report the following: "More than one million Armenians perished as the result of execution, starvation, disease, the harsh environment, and physical abuse. A people who lived in eastern Turkey for nearly 3,000 years [that is, 2,500 years before the Islamic Turks invaded and occupied Anatolia, now known as “Turkey”] lost its homeland and was profoundly decimated in the first large-scale genocide of the twentieth century. At the beginning of 1915 there were some two million Armenians within Turkey; today there are fewer than 60,000." Furthermore, there is actual correspondence from a member of the Turkish regime at the time. One of the documents authenticated by Turkish authorities in 1919 is a telegram sent in June 1915 by Dr. Sakir, one of the leaders of the secret organization that carried out the planning and implementation of the Genocide. He asks the provincial party official who is responsible for carrying out the deportations and massacres of Armenians within his district: "Are the Armenians, who are being dispatched from there, being liquidated? Are those harmful persons whom you inform us you are exiling and banishing, being exterminated, or are they being merely dispatched and exiled? Answer explicitly....". It sounds pretty systematic, premeditated and highly coordinated to me! The historical deniers of genocide will try to get you to believe that the indigenous Armenians died through the process of resettlement, or because they were caught in war zones. But the numbers don't lie ... 1,500,000 deaths over a two-year period aren't "accidental", or because they were in the wrong place, at the wrong time. So the question remains -- Why the denials? And why hasn't the U.S. government officially confirmed the Armenian Genocide ... especially since the U.S. House of Representatives has a long and proud tradition of reaffirming America’s moral stand against all genocides – past and present? Here is a list of those they have acknowledged in the past, by either commemorating them or condemning them: the Holocaust, the Cambodian genocide, the Darfur genocide, the Ukrainian genocide, and the Bosnian genocide. Furthermore, 44 individual states have acknowledged it! Perhaps some of the reasons for denying the past atrocity find their equal in the attempts to deny what the current caliphate is attempting to accomplish. In the period immediately after World War I the tactic was to find scapegoats to blame for what was said to be only a security measure that had gone awry due to unscrupulous officials, Kurds, and common criminals. This was followed by an attempt to avoid the whole issue, with silence, diplomatic efforts, and political pressure used where possible. In the 1930s, for example, Turkey pressured the U.S. State Department into preventing MGM Studios from producing a film based on Franz Werfel's The Forty Days of Musa Dagh, a book that depicted aspects of the Genocide in a district located west of Antioch on the Mediterranean Sea, far from the Russian front. Today, we hear the White House press corps downplaying the atrocities of ISIS against Christian minorities in the Middle East; after all, they are only like a "J.V. team", right? Furthermore, the ANCA reports that the Turkish government has hired former U.S. Congressman to lobby on their behalf in attempts to keep the U.S. from officially recognizing the Genocide. In the 1960s, prompted by the worldwide commemoration of the fiftieth anniversary of the Genocide, efforts were made to influence journalists, teachers, and public officials by telling "the other side of the story." Foreign scholars were encouraged to revise the record of genocide, presenting an account largely blaming the Armenians or, in another version, wartime conditions which claimed the lives of more Turks than Armenians. Thereafter, Turkey tried to prohibit any mention of the Genocide in a United Nations report and was successful in its pressure on the Reagan and Bush administrations in defeating Congressional resolutions that would have designated April 24 as a national day of remembrance of the Armenian Genocide. The Turkish government has also attempted to exclude any mention of the Genocide from American textbooks. Stronger efforts still have been made to prevent any discussion of the 1915 genocide being formally included in the social studies curriculum as part of Holocaust and genocide studies. Does that ring a bell? Do we not see that the current Caliphate is influencing the media, and using them, to tell their side of the story? Are not some journalists and public officials complicit in playing down the danger of Islamic radicalism? Isn't Common Core attempting to rewrite history, as well as present a sanitized version of Islam, while decrying the barbarism of Christianity? So, it is up to the world to tell the truth and to warn of the familiar images of genocide that are flooding out of the Middle East. And in case you still doubt the veracity of the Armenian Genocide, I invite you to read the miraculous story of a 100-year-old Armenian woman, who is one of the last people alive to give a first-person account of the annihilation of her people. Read her story so that you will know the horrors of genocide, and so her memories will never die. Psalm 116:115 "Precious in the sight of the Lord is the death of his saints." I cannot imagine facing the coming weeks, months, and years (if we have them) without abiding in Christ! It grieves my soul to think of the millions of people (including those who consider themselves Christians) who will suffer in the near future. I am grateful to hear from fellow Believers such as yourself, who is willing to give up this life for the glorious eternal one. God bless you, and may Christ shelter you from the wrath that is coming. I find these type of articles compelling to answer the "so what test" of all the issues we deal with when it comes to religious and ethnic boundaries as it relates to history - and it is sometimes one sided and mis-interpreted and hate carried on generation to generation. I'm not sure what your point is ... if it is that genocide has been perpetrated in the name of faith throughout history, I would agree. But if you are saying that all genocides are alike, and it is some "game" by a sick-minded "creator", I would have to disagree. I abhor ethnic cleansing in the name of any faith, but as a Christian, I believe in the Bible and what the one true God has to say about upholding my faith. In this article, I am speaking to my fellow Christians, about this particular time in history. I meant to be narrow in my scope and my appeal.